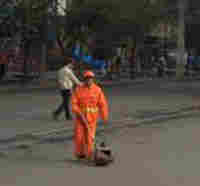 Last week, I posted a photo of downtown Chengdu here, and Sean Powers wrote to us with a comment asking, "Is the person in the ... photo wearing an orange jump suit a city worker?" We've been trying to figure that out. The man in the photo is a street sweeper, and we've been asking a number of sweepers about their jobs. It appears they're hired by contractors, and we're pretty sure the contractors are hired by the city. I've been stunned by just how many of these orange-clad sweepers there are here. Chengdu is dirty in many ways -- it's choked with cars, blanketed by smog -- but there's a legion of street sweepers who are paid to flick away every last bit of street trash. You see them everywhere you turn. They work the sidewalks, they work the streets, they sweep their way down the highways, just inches away from cars barreling by. (I've also seen workers busily washing the silver guardrails that divide the highways, crouching down perilously close to traffic, breathing fumes all day long.) A Westerner here told me she's seen street sweepers shake the trees in the morning to dislodge any loose leaves so they can sweep them up right then, rather than have them make a mess later on. 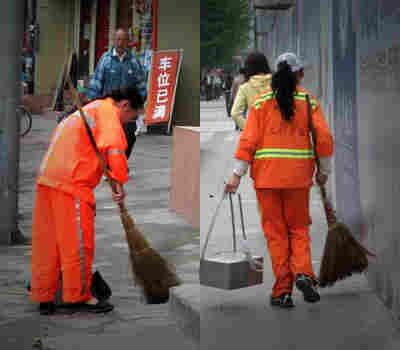 Yesterday, producer Andrea Hsu asked a sweeper how much she earns for keeping the streets tidy. She said she makes 650 yuan a month -- that's about $93. She said she works eight hours a day, five days a week, so that works out to about fifty cents an hour.